He has been called India's Tolkien and Asia's Paulo Coelho and has a huge fan following. I first heard of Tripathi in 2010, just days after his first book The Immortals of Meluha was published. It was the first part of a trilogy based on Shiva, one of Hinduism's most important gods. A fine blend of myth and history, the book read like a fast-paced airport thriller - it was gripping and "unputdownable". At the same time, it discussed religion and philosophy, the eternal battle between good and evil and the moral dilemmas that normally accompany such debates. Written almost entirely during his daily commute to and from work, in the back seat of his car, the book took him five years to finish. "After it was completed in 2008, I approached every single publisher, big and small, but everyone rejected it," the Mumbai-based writer told me during a recent visit to Delhi. "They told me there was no hope for this book since the market was dominated by the youth and that they were not interested in religion. Also, they said since everyone knew the story of Shiva, why would anyone buy another book on him? "I stopped counting after 20 rejections." That's when he decided to self-publish. His wife came up with a clever idea to promote it - the first chapter was printed as a booklet and displayed near the cash counters in book stores two weeks before the launch, and customers were encouraged to take away free copies. The campaign was so successful that within the first week of launch, Meluha hit the bestseller chart. Readers who had read the first chapter returned to book stores, asking for more. The second and the third books in the Shiva trilogy - The Secret of the Nagas and the Oath of the Vayuptras - published in 2011 and 2013 were also huge hits and the trilogy sold more than 2.75 million copies. Bollywood director Karan Johar has bought the rights to make a Hindi film on Meluha, and Tripathi has also sold English film rights to an unnamed Hollywood filmmaker. The success of the trilogy changed his fortunes - according to reports he was paid a record signing amount of $1m (£770,932) for his next series, and huge publicity campaigns have turned his book launches into major events. 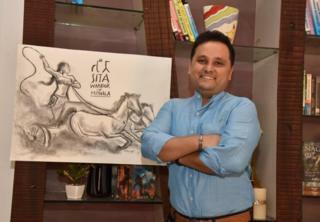 His Ramchandra series, based on the story of Hindu god Ram, was launched in 2015 with The Scion of Ikshvaku. Sita: Warrior of Mithila is the second in the five-part series. Although critics say his books lack any literary merit, they admire him for his ability to "create completely new stories from old ones". Says Tripathi: "The stories are thousands of years old, but they are so rich, so deeply ingrained in our genes, that we want to hear them over and over again. There can be different interpretations of old stories. The philosophical core remains, the soul remains, but the packaging can be new." And his packaging is delightfully new - his Shiva is a marijuana-smoking Tibetan immigrant who's more human than god, with weaknesses and failings. And Sita is not a meek woman who obediently follows her husband, Lord Ram. She is a warrior princess who rises to become the prime minister of her state, a goddess who fights to defend her people. A voracious reader, the 42-year-old author says his knowledge of scriptures, philosophy and religion comes from the books he reads and his family, especially from his grandfather who was a priest in the holy city of Varanasi. An atheist during his college days, he says he "returned to faith" while writing his first book. "I believe faith gives peace. I believe in religious symbols and rituals. I do what gives me peace. I visit a Shiva temple every Monday. Most devotees pour milk over the Shiva lingam, I don't do that. I buy milk and give it to a beggar because that gives me peace. But I don't judge others who pour milk on the lingam." Despite his extreme popularity and celebrity status, he doesn't participate in shrill television debates, uses social media judiciously and has so far managed to stay out of controversy. "Most controversies are created. Journalists trigger controversies for ratings, artists do it for sales. I don't want to sell through controversies. I'd rather not sell my books then," he says. Because of the sweep and popularity of his fiction, he's been compared to JR Tolkien and Paulo Coehlo. "I'm a fan of both," he says. "Paulo Coehlo's Alchemist is one of the best books I've read and I like Tolkien for the depth of his thinking. But my writing is influenced by our ancient culture, my pride in it. And I'm influenced by all the books I read." When I ask him about his future plans, Tripathi says he's got enough ideas to keep him going for the rest of his life. "I have plenty of ideas to write for a lifetime. I'm afraid that I will die before writing them all and I'll carry them into my cremation pyre with me," he says.